You are fearfully and wonderfully made – really! My maternal grandmother died when my mother was very young. Because of this, I know very little about her life. My mother had no no stories to tell about her, no favorite recipes, no special songs. Honestly, I’m not even sure what her name was. 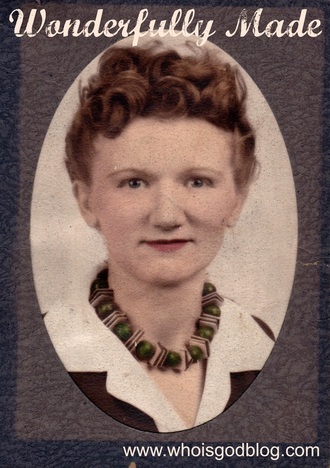 I do have one fuzzy memory of my cousins showing me a photo of my grandmother. It was black and white, and she was walking somewhere. Her hair was blonde, and she had a pretty face. But even though I know very little about this woman, I found out recently that I am indebted to her for a choice she made long ago. You see, as a young mother with already two children, my grandmother contracted tuberculosis, a bacterial infection often found in the lungs. At the time of my grandmother’s life, the disease was widespread and dangerous. Not too long ago, my mother obtained some research about my grandmother that exposed a telling choice she made while pregnant with her. The research said that doctors had advised my grandmother, because of her condition, to abort her unborn baby. But the report said that because my grandmother and grandfather valued their family, they chose to continue the pregnancy despite her illness. My jaw probably dropped when I read that a few summers ago. I remember telling my sister-in-law that it was because of my grandmother’s choice that my brother and I got to experience life. And, come to think of it, the same goes for my five children … and her two children … and the list gets to continue on and on doesn’t it? All because a grandmother I’ve never met understood that her babies were wonderfully made. So if Tozer and my pastor are right, there is a direct correlation between our viewpoint of God and our respect for human life. Isn’t it sad that as our nation moves farther and farther away from God, the womb becomes one of the most dangerous places to be? Pray with me that our nation would turn to God and that our babies would have the same opportunity that my grandmother gave me. Because all of us are wonderfully made.